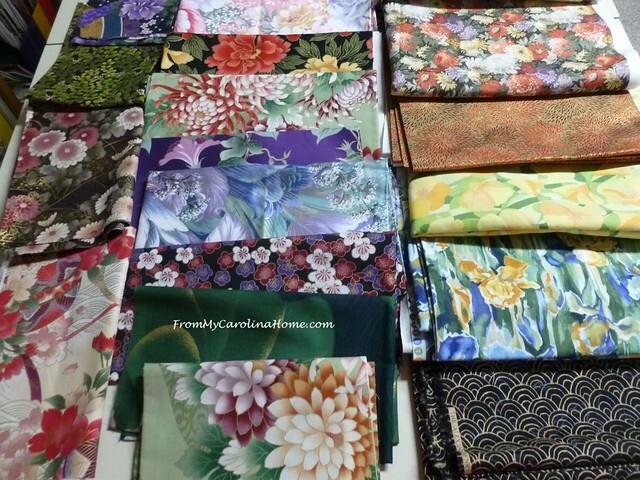 Recently, I was having a lovely email conversation with a lady online, and she mentioned that she had a huge amount of fabric she was trying to sell. The fabric came from a friend with medical problems, and the sale proceeds would go to helping with the expenses. When we realized that we only live about an hour apart, she invited me to bring a few friends to shop. I couldn’t pass that up!! She mentioned that she would be updating the story on her blog, so I popped over to see it. Imagine my surprise to find I was talking with nationally known speaker and author Mary Stori!! Her blog is The Inside Stori. I ran to the basement, pulled out my copy of her book and took it with me. 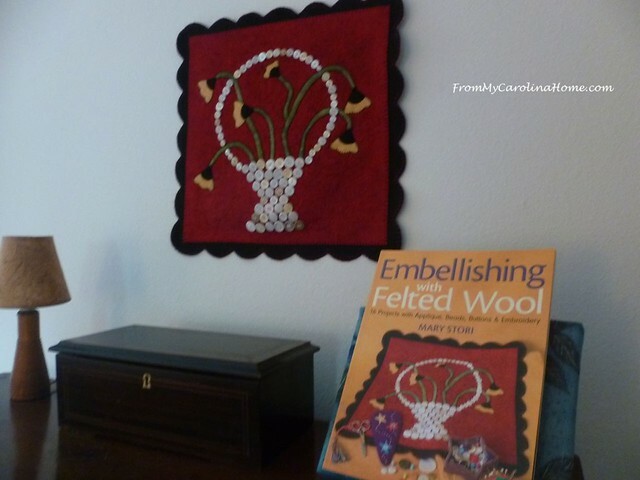 Look, on her wall, the original wool work featured on the cover of one of her many books! 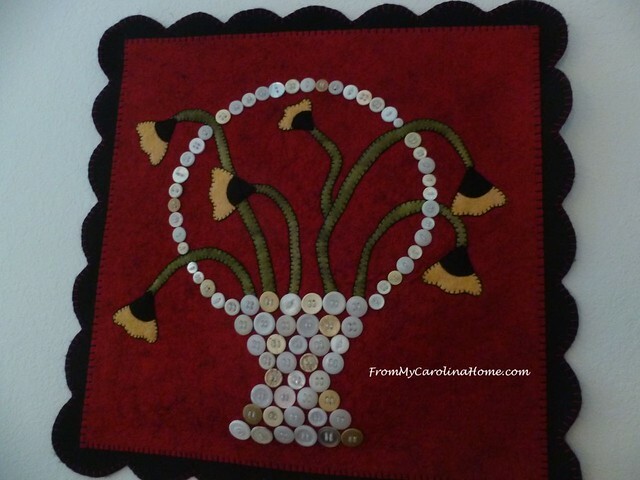 Her work is so inspiring to me, embellishing wool applique is something I like to do. It was fun to see this pretty piece in person. She graciously allowed a photo of us, and while I don’t usually show pictures of myself, here we are. That’s me on the right with a goofy grin having met a true creative celebrity in my eyes. She was so gracious, and signed my book with the most lovely sentiment!! Thank you, Mary! This book is Embellishing with Felted Wool. She has several more on embellishing and beading. She’ll have an exhibit at the NC Arboretum July 28 – Sept. 16th in the Education Building called Nature Across the Carolinas Fiber Art with Quilts. 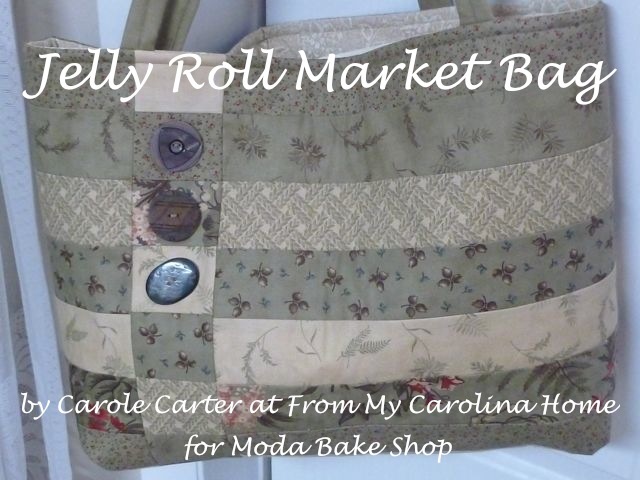 She is one of three North Carolina fiber artists that will be showcased. I have several wool patterns here on the blog, all with some kind of beading or button embellishment. Here are a few, there are pdf downloads of the patterns on the posts. 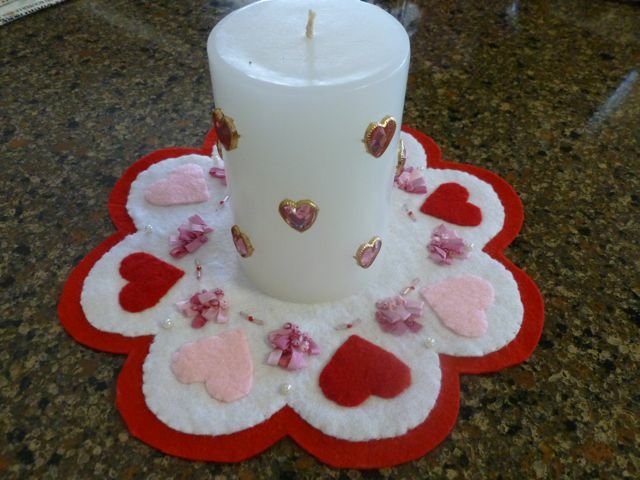 First, my Valentine Penny Rug with ribbon embroidery, pearls and seed beads. 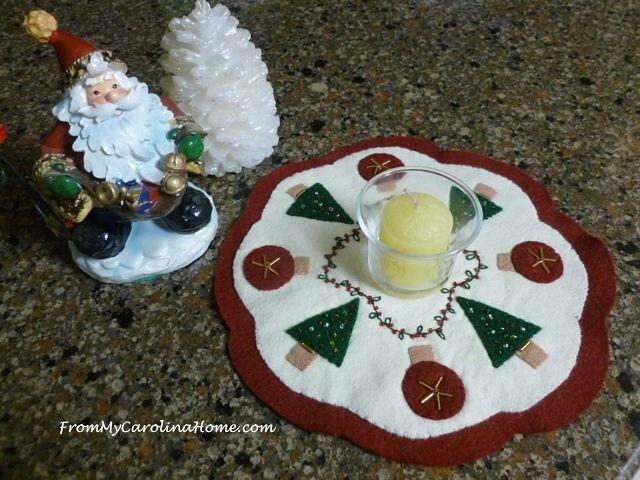 Here’s my Christmas Wool Penny Rug Pattern with seed bead accents. 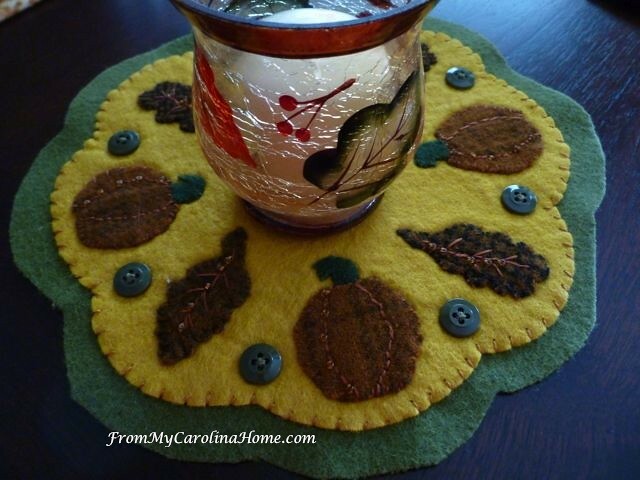 The first Autumn Jubilee Penny Rug was a stitch along, start HERE. 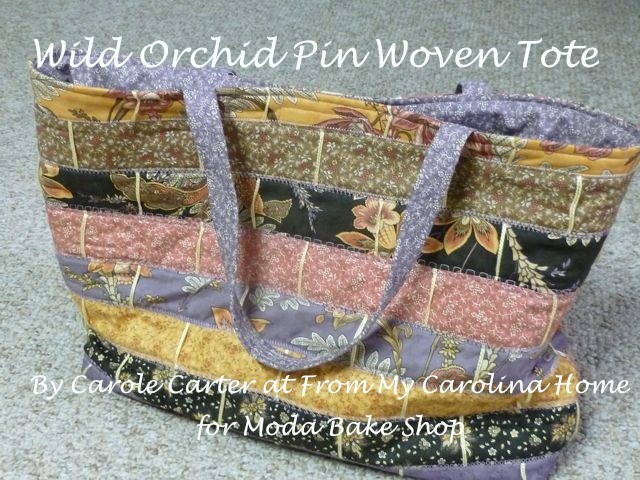 I used buttons as embellishment on this one. 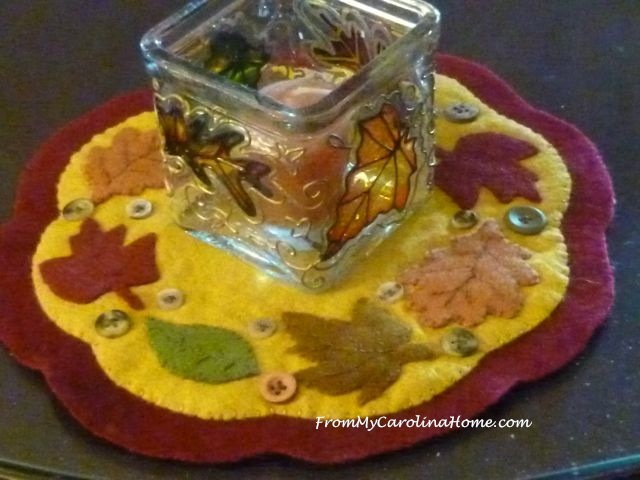 And here is the second Autumn Jubilee Penny Rug from last fall. I need to get designing for this year’s Jubilee soon. Buttons were used here too. Anyway, back to the fabrics, did you see those stackable bins in the room behind her in the photo above? Mary had 22 of those, with more fabrics stacked on tables. It took our little group over an hour to pet it all. She had lots of Oriental, some batiks, some quilting cottons, English Shweshwe, Liberty of London solids, and a few other designer pieces, all at rock bottom pricing. She’ll have some on her blog if you are interested, at least what we left her, LOL!! I came home with a huge bag of gorgeous orientals, lots of Kona Bay! Sad that Kona Bay has stopped production, they had some of the most beautiful oriental prints ever made and all high quality. 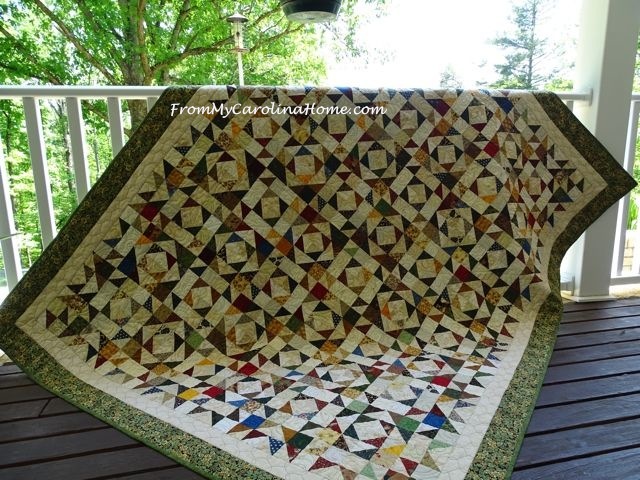 Most of the pieces are a yard or more, with some 1/2 yard pieces on the left and a few fat quarters too pretty to pass up. The fabric has such a nice hand that some will be made into blouses. I don’t make clothes often anymore, but I have been disappointed in the lack of pretty prints in the stores for the past couple of years. One of these patterns might work. There are 2 yards of this print, so I have options. I’ll have to redraft these patterns if I decide to use them, as I have lost some weight since purchasing these and they will now be too big. But luckily, that isn’t hard to do. I have to modify most patterns anyway to accommodate my petite height. This one is barely a yard, but it is gorgeous. 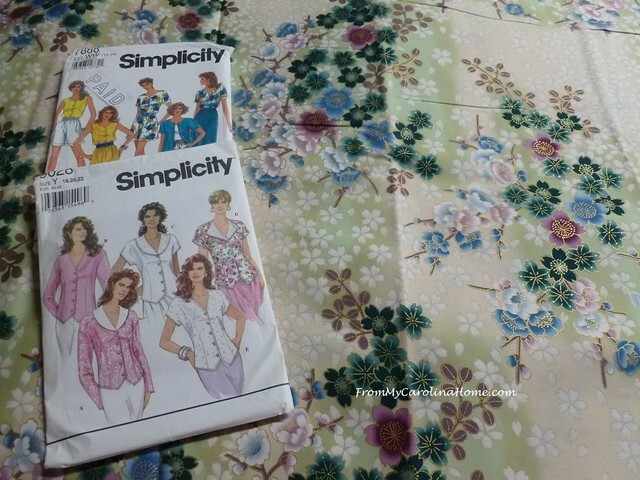 The little white sleeveless top on this pattern might work with the amount of fabric here. 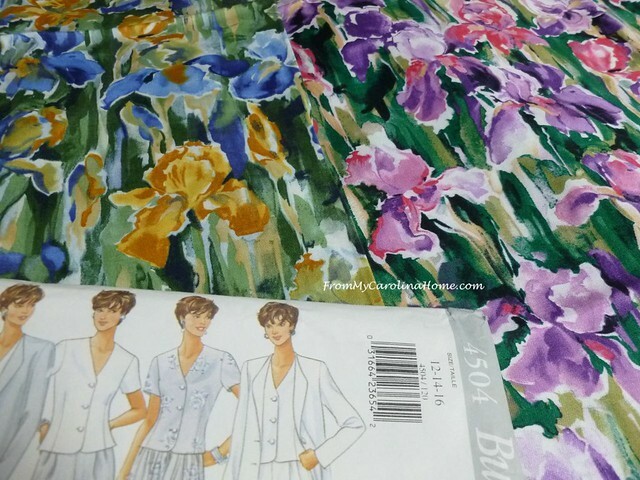 This pretty iris print was in two colorways, both would make nice tops. Actually, the purple has enough yardage to be a sundress. I used to wear those all summer, but haven’t made one in a long time. This pattern with the short sleeves would be good. I don’t mind the darts, and I can make the sleeves a bit longer too. 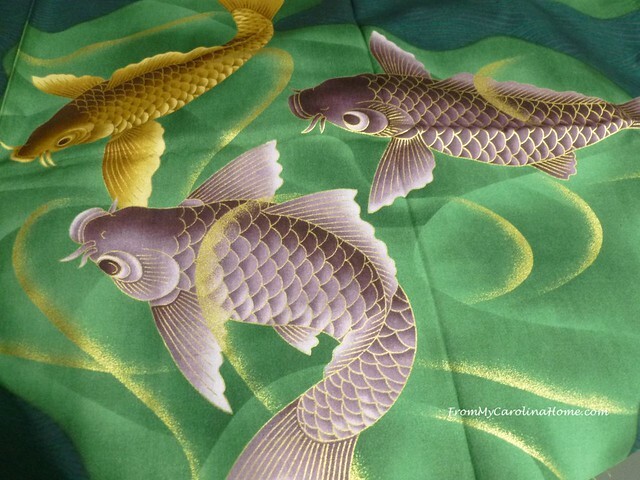 I thought this coy Koi print would be a great wall hanging. Unfortunately, the tails of the fish at the top and bottom are cut off. If only she had bought a bit extra! But there are some tails on the other end that I might be able to piece together, we’ll see if I ever get around to attempting that. 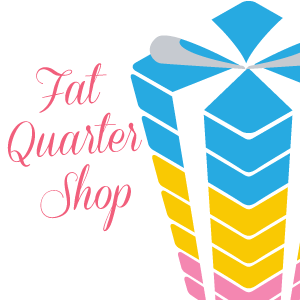 This stunning print had to be Kona Bay, although it is just a fat quarter. I love the purple and black together with the gold. Now to decide what to do with some of these fabrics. I am still inspired by Oriental culture, food, and sewing and just bought a book on Origami at the library book sale rack. Then I ordered another book at Amazon of Japanese Quilt Inspirations, as I couldn’t resist it and hope it will give me an idea for these fabrics. If you are new to the blog, click on the category Japanese Inspired February for a look at that event and the original projects created for it, along with Japanese gardens and a few original recipes. I don’t usually post on Saturdays, but I did a recipe roundup yesterday of my best summer ideas, just in case you missed it. Free Watch Weekend at Craftsy.com through 7/1/18, today is the last day. Stream 10 free classes specially made for the junior chefs, fashion designers, cartoon artists, and crafters in your house. 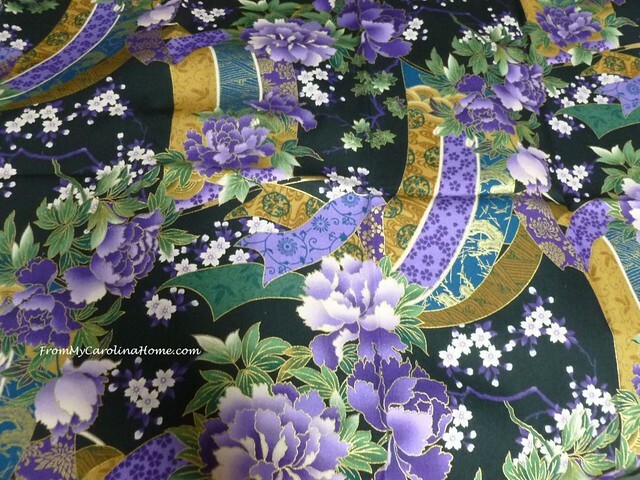 What would you make with this fat quarter of Oriental fabric? Do you like to do wool applique too? Cute picture, Carole! 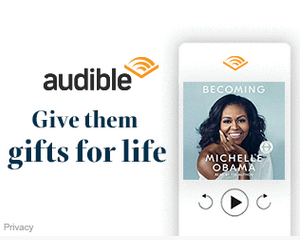 I don’t allow mine often either…but with Mary Stori?!! You just had too! Happy July! How fabulous for you! Not only for the fabric but you also met an author and now a friend! Loved today’s post! I was able to sit here and drool over your fabric finds and appreciate them, without spending any money. 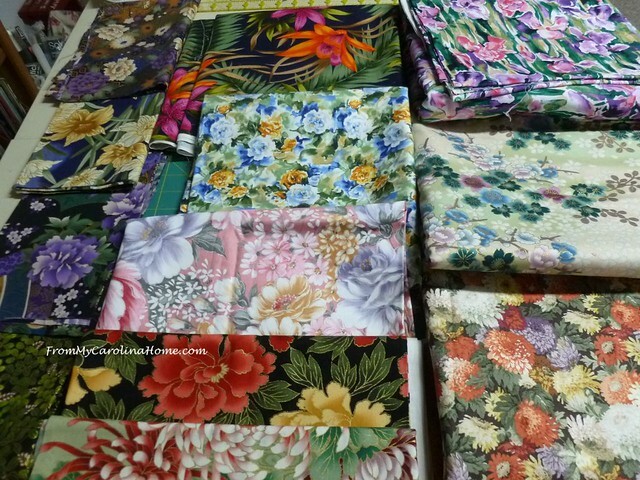 Such a splendid and varied collection of gorgeous fabrics this woman had. I’m sure it pained her to have to part with them, but age and illness will do that. I think of that all the time, and am furiously trying to make some sort of dent in the 3, 6ft. commercial grade, metal shelving units I have packed with fabric, Not that I’m being picky, but the fish are called Koi, and I have some swimming in a pond in our back yard. They are so beautiful, with their long flowing tails, and we really enjoy them. Thanks for sharing your experience with Mary. WOW……I’m blushing….thank you for your flattering post! AND….a big thank you for plugging the quilt exhibit, “Nature Across the Carolinas: Fiber Art with Quilts” at the NC Arboretum, opening July 26th. Not only will my work be in display, but that of my two buddies Judy Simmons & Kate Weston as well. We three also share space a Woolworth Walk Art Gallery in downtown Asheville. 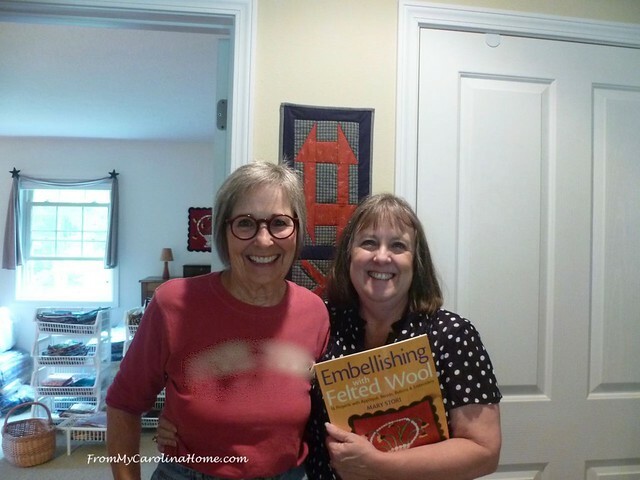 It was great to meet and spend time with Carole and her pals…..it’s always a pleasure to get acquainted with other fiber lovers! Hello Carole; I am just thrilled for you that you got to meet Mari Stori! Plus, now that you have spoken online and now in person, hopefully the two of you will speak more often and form a nice friendship. The fabrics that you have chosen are gorgeous and no matter what you decide to do with them, the final result will be outstanding. Also, do not forget all of the lovely scraps that you will be accumulating. I enjoyed your post today, so thank you for sharing all of your excitement with us and have a spectacular day! Oh Wow Carole what a very awesome opportunity for you. 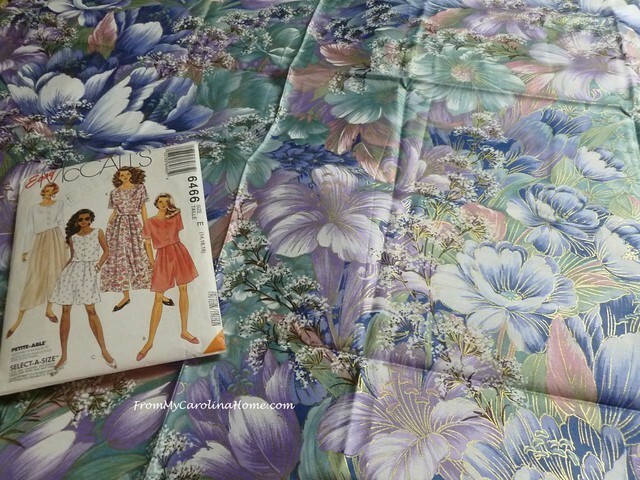 when I way buying fabrics I loved Kona Bay their orientals are superb I agree. Enjoy and have fun sewing!! Love your blog. You are sew gifted. I have been amazed at your quilt restorations. I had no idea this was possible. I was given a piece of the Kona Bay fabric like the one you have and didn’t know how to send you a photo so I am uploading to Pinterest. Take a look. I love the challenge of using something beautiful that was completely unplanned. Thanks for sharing your gifts. What a thrill that would have been. Mary is a great speaker and is so talented. You also came home with some amazing fabrics. Have fun with them. what a fun post! :)The coincidence and then all of the lovely fabrics! Wow, that’s some gorgeous fabric! If you want to wear that gorgeous print, I would cut it in half lengthwise, French seam the two ends together, and do a tiny serger hem around it, then you would have a scarf of sorts that would be long enough to wrap a couple of times. How exciting to meet someone you admire! How special to meet someone you admire and like the work of. 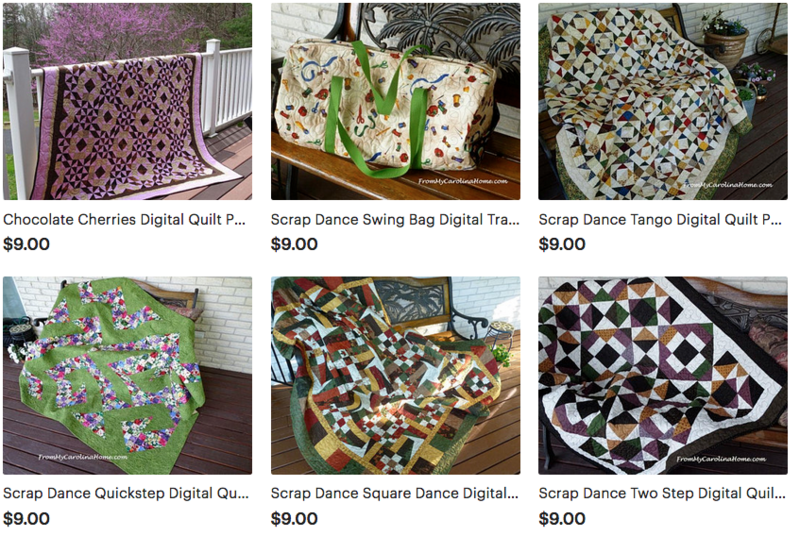 …..such a lot of beautiful fabric, what a great sale. Looking forward to seeing your creations. 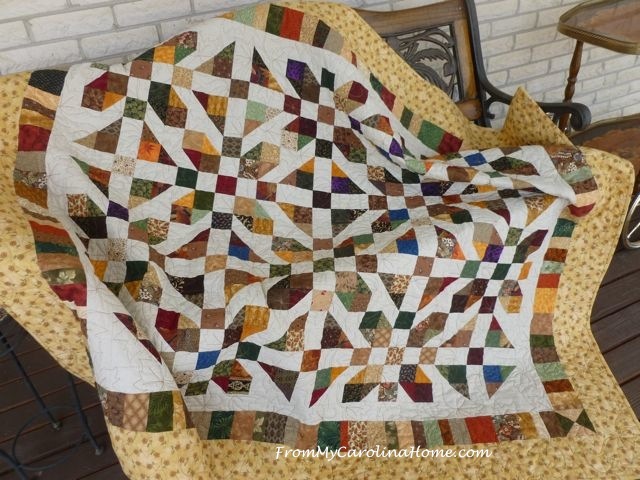 Beautiful fabrics– wish I were there! but not as if I need any more stash!